Reading Bruce Horovitz’s article this morning in USA Today (pasted below) was music to my ears. At Ellish Marketing Group we have been working with restaurant clients both internationally and domestically on profitably enhancing their brands. We guide our clients through a brand positioning process to define what their brand is, what their brand stands for, what their brand offers and, importantly, what is different about their brand. Building on a restaurant’s brand positioning, we conduct comprehensive competitive analysis to understand the target audience’s needs and wants, strategic menu engineering, and consumer research including TURF (Total Unduplicated Reach and Frequency) analysis. We then create menu concepts and specific menu items that will be true to the brand, have a competitive edge be profitable. It can be challenging when creating a new menu or looking to optimize an existing menu when many internal or external team members are afraid to drop any existing menu items. Utilizing the above mentioned Ellish Marketing Group approach we have allowed our clients to identify a discrete number of menu items that deliver variety and value to their current and prospective customers while at the same time optimizing reach and frequency. The net result is a menu with the fewest number of menu items that reach the broadest possible customer base. This optimized menu is true to the brand (vs. trying to be everything to everyone), provides real operational focus (doing fewer things really well), allows for easier training of employees (less things to learn), enhances efficiencies in supply chain (fewer SKU’s) and bottom line – it increases sales and profits. Many restaurant consulting clients of ours (including startups, brand refreshes and turnarounds) that have embraced this approach of “Less Is More” include: Toppers Pizza, Bennigan’s, Mayo Clinic, National Coney Island, Denny’s, American Blue Ribbon Holdings, Great Wolf Resorts, Pollo Campero, Tai Pak Asian Wok Kitchen (in Mexico) and La Crepe Kitchen (coming soon in Guatemala). Their positive results speak to the success that this process has brought to their brands. The restaurant industry’s Next Big Thing is shrinking the menus. For years, most major restaurant chains have been expanding their menus at a breathless pace in response to intense competition and consumer demand for more choices. But now, some chains are doing the unthinkable: cutting the number of menu items. The theory is simple: less is more. More quality. Faster service. Hotter food. Not to mention lower prices, lower costs and higher profits. For the nation’s $683 billion restaurant industry, hit by an uncertain economy and changing consumer habits, this may be an unlikely, back-to-the-future path to progress. Fewer menu options not only cuts costs, but — in theory — can make customers happier because chains can do a better job with their most popular menu items. That’s one reason why, over the past few years, IHOP has whittled down its menu from 200 items to about 170, says Julia Stewart, CEO of parent company DineEquity. BJ’s Restaurant has cut entrees from 181 to 150 and aims to get closer to 100, says CEO Greg Trojan. In three years, Tony Roma’s has slashed its menu items from 92 to about 60, says Chief Operating Officer Brad Smith. This pruning is mostly about appealing to Millennials. They value basics such as food quality, flavor, local sourcing and the ability to customize their meals over massive menus. “We can no longer be everything to everybody all the time,” says Smith, of Tony Roma’s. “I don’t think customers are out there counting the number of items. It’s about producing better quality products.” In an even clearer signal of less-is-more, the chain just opened its first TR Fire Grill prototype in Orlando with just 32 menu items. This less-is-more philosophy has spread industry-wide. For the first time since restaurant researcher Technomic began tracking chain restaurant menu items a decade ago, the average number began to fall this year, says Darren Tristano, executive vice president. The total number of menu items at the nation’s top 500 restaurant chains is down 7.1% this year — from 40,658 in 2013 to 37,770 this year, reports Technomic. The biggest drop is in entrées, down nearly 9%, the company reports. Appetizers are down 8%, dessert items down 7.5%. “Too many choices make it hard for consumers to make a choice,” says Tristano. . It also can make it difficult for consumers “to remember why they go to a particular restaurant.” As a result, he says, the entire industry is “moving from ubiquity to specialization.” Many chains aim now to differentiate based on quality — not breadth, he says. It may seem contradictory, but the menu shrinking comes at the same time chains also are trying to offer more customized options for the remaining items. The industry leader in this is Chipotle, which has just four main items on its menu — burritos, tacos, burrito bowls and salads — made with 18 optional ingredients. Those ingredients can be put together in more than 60,000 ways, notes spokesman Chris Arnold. Beyond Chipotle, several chains, particularly burger specialists Five Guys and In-N-Out Burger, have made a killing on “less is more.” Five Guys has just five core entrees: burgers, hot dogs, grilled cheese, a veggie sandwich and a BLT. But fifteen free toppings make them customizable in more than 250,000 possible combinations. Five Guys is testing milkshakes, which, if added to the menu, would be the chain’s first truly new product line in about 20 years, says spokeswoman Molly Catalano. Don’t think giants McDonald’s and Burger King haven’t been watching. McDonald’s CEO Don Thompson recently told analysts that he wants to simplify the menu because it has grown confusing for some consumers. At the same time, he said, McDonald’s wants to offer more customization of core products such as burgers. At most restaurants, entrees are disappearing fastest, with the average at full service restaurants down from 60 in 2013 to 55 this year, reports Technomic. But it’s not always as simple as removing slow-moving items, warns Tristano. It’s sometimes the best customers who prefer those items — and no one wants to upset them. Customers even showed up wearing “Bring Back Potato Skins” T-shirts. And they easily won this skins game. The platter is back. The total number of menu items offered at the top 500 restaurant chains is down in 2014 after several years of steady increases. Bennigan’s Franchising Co. on Thursday opened its first company-owned restaurant since the heritage brand filed for bankruptcy and closed hundreds of units in July 2008. Bennigan’s opened the new 4,200-square-foot location in Appleton, Wisconsin. The restaurant features a new logo and signage, a centerpiece bar with 18 beers on tap, 180 seats and entertainment options, such as low-tech dartboards and high-tech Wii bowling as well as interactive table kiosks with pay-at-table technology. The menu features new items in the salad, sandwich and entrée sections but retains such signature dishes as the Monte Cristo sandwich. “We want to be known for having “American fare with Irish hospitality,” Goronkin said. 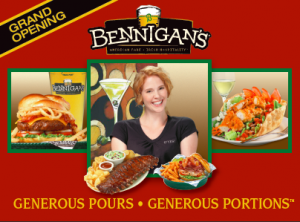 Bennigan’s Franchising Co. acquired the Bennigan’s brand in 2008, after parent S&A Restaurant Corp., a division of Metromedia Restaurant Group of Plano, Texas, and affiliated companies filed for Chapter 7 bankruptcy liquidation and closed about 240 company units, including both Bennigan’s and Steak & Ale. Working with Warren Ellish and the team at Ellish Marketing Group, Bennigan’s developed an enhanced brand positioning, conducted consumer research, launched a new corporate identity, forged significant menu development and testing and included franchisee input all along the way.